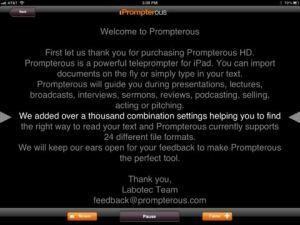 Prompterous is the first application to turn your iPad in a powerful teleprompter. Prompterous will guide you during presentations, lectures, broadcasts, interviews, sermons, reviews, podcasting, selling, acting or pitching. Import any type of document for both online or offline reading. 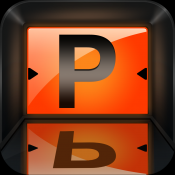 Prompterous is the only application, of its kind, to support 24 formats including popular DOC, TXT, PDF, EPUB. You can also type in your text or edit on-the-fly any existing document. Documents are securely stored for your viewing only. Powerful combination of settings such as fonts, colors, backgrounds, styles, alignments, flipped text, and timer are fully customizable. Esta app convierte al iPad en un Teleprompter, lo cual ampl�a sus capacidades como herramienta educativa: desde una ayuda para poner en marcha una presentaci�n, hasta para ensayar los textos de una obra de teatro. Adem�s las posibilidades de este Teleprompter son bastante buenas, comparado con otros de su mismo precio: diferentes tipo de fuentes, control de la velocidad del texto, posibilidad de invertir el texto, etc. La recomiendo.